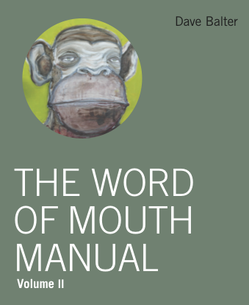 First came GRAPEVINE, now comes … THE WORD OF MOUTH MANUAL (TWOMM). Dave Balter, founder/ceo of the notorious BzzAgent managed word-of-mouth media company, shares his unique perspective on how best to get people talking about products/services in TWOMM. True to his credo, he’s doing something to generate buzz. Instead of releasing the breezy-to-read TWOMM through a major publisher, Balter is self-publishing it. And, as any self-publisher must do, he’s self-promoting it by offering the manifesto as a free PDF download. He’s also offering it as a bound book for sale on Amazon. But if you are of the read it on the screen ilk, DOWNLOAD the manifesto HERE. Long-time Brand Autopsy readers know I ain’t the biggest fan of BzzAgent. On the WOM pendulum, Dave swings to the side of Creationist WOM and I steadfastly cling to the side of Evolutionist WOM. Consider me part of the 00.001% as I’ve been fortunate to be a marketer who has relied on tapping into PURE word-of-mouth from evangelical customers from my marketing days at Starbucks Coffee and Whole Foods Market. Both of those businesses were built upon designing and delivering a product and experience worth talking about. Judge for yourself as to the validity that pure word-of-mouth happens only when the stars align a certain way. Do that judging by downloading/reading Dave Balter’s THE WORD OF MOUTH MARKETING MANUAL. I agree (http://digg.com/business_finance/What_Dave_Just_Did [rustybrand]) with your critique of Dave Balter. He is smart and his company seems to have done well, but great branding (at least in a sustainable way) has much more to do with what you do than what you say...and we need to be careful that what we say mimics the experience of what we offer. Thanks for the heads up on what is sure to be an interesting and informative read! The new "book" by Dave Balter shows just what a unique concept the WOM marketing is. We humans already do this. If someone else is buying something it makes us want it more. Anyone who has jostled over the last pair of designer shoes on the sale rack (even if they are not your size) knows this. I believe the Bzzagent concept is good and feel they have continued to improve the system. The combination of the information highway and human gossip is a winner. I am a volunteer Buzzagent, and I'm getting ready to download the PDF. I may just enjoy it as I lean more toward the creation theory than evolution!LOL Thanks for having it here! I'm about halfway through, now. I can see where Dave is coming from, but at the same time, as a BzzAgent, I know that a lot of people are out to get freebies of any sort, and screw honest WOM. Myself, I just ignore most of the "frogs" that bore me because I'm too apathetic to buzz positively OR negatively on something I could care less about. But, I don't know, some people have a lot of free time on their hands. I think there is a lot more pure WOM than he credits, though. Heck, go to the supermarket sometime. I work at one, and just by virtue of needing something to talk about, my customers and I often debate the merits of new products. I'm not getting commission, but if I like a product we've just gotten in, I'll talk about it. Anyway. I think it's all a bit fluffed up with pop culture references, and dumbed down to gear more towards agents than marketing execs, but I can appreciate the explanation of his theories, I suppose. As a Bzz Agent I support Dave, not to be a kiss up, but because I am a free person generating genuine conversation on a sample of a new product. People talk about new products all the time. Companies give out samples all the time. The difference with being a Bzz Agent is I get feedback on the sample. I do not sway anyone's opinion, I give them a sample, and LISTEN and HEAR what THEY have to say. Giving out samples and not getting feedback is like having a blog and not letting anyone comment on it. I already experienced this with 800ceo. As someone with no formal education in marketing or advertising (I majored in English), I thought The Word of Mouth Manual is a good introduction to several components of marketing. It also goes into great depth explaining WoM, and its relevance in today's society. I felt that Dave does spend a lot of time defending WoM services (almost all of section II); however, he presents compelling evidence of both success and honesty. In particular, II.4 and II.6 deal with the issues of false BzzAgents and the necessity of excluding money incentives for WoM. I found the chapters dealing with Viral vs. WoM to be particularly insightful; I feel that as more research goes into the viral phenomena in this era, we will be able understand why it occurs, and possibly how to turn it into a successful campaign. Dave doesn't mention one aspect of viral marketing that irritates me to no end, which are corporate attempts at viral videos. These strike me as annoying, fake and condescending, and do more harm to a brand image than good. I have been a Buzz Agent for about a year now. i have to admit that initially the pull of free stuff was strong and having to provide reports of the Buzz I had spread seemed fair. I was very worried initially that it would feel unnatural and forced, but I very quickly found out that it does not have to be either. I suppose part of the reason why I was so nervous is the nature of the first campaigns that I signed up for. One was for a razor and the other a yoghurt to improve digestive health. Neither is really the kind of stuff that you would normally discuss.I was worried about how I could get some Buzz going. It was so easy. For the razor, the post office had been a bit rough with the buzz kit and the razor was missing. Fortunately it had just fallen out and soon I was reunited with it. The lady at the post office was curious about it and we got chatting quite naturally. This really broke the ice.It is amazing how much word of mouth advertising is going on in our staff room alone, most of it completely spontaneous and not in any way, shape or form organised. So i think it is a great idea to organise and guide this and tap into a great resource. With the yoghurt one colleague was complaining that she had forgotten to bring a snack. So I gave her one of my yoghurts. So we got talking. I found out that like me she suffers from IBS. So not only have we both discovered a new product, but we realised that we also have a health issue in common. So I found that I was gaining much more by being a Buzz Agent than just being sent free stuff. I also have to say that I was more than just a little pleased when I was recently away on business travel with a colleague that she was trying to find replacement blades for the razor that I buzzed with her almost 12 months ago. New BzzAgent here looking forward to reading this book and sharing my thoughts. I am a volunteer BzzAgent. Most BzzAgent's are completely transparent and we are proud of it! I loved the manual. I wouldn't have purchased it but I loved every word. Anything that people talk about is considered word of mouth, whether it's good, bad, or indifferent. The world would be a totally different place without Word of Mouth. As a Buzz Agent, I use WOM to share new products with people who haven't heard of or tried them yet. Often, I am able to share free samples, or provide coupons for a discount. These coupons and samples allow people to try a product they might normally hesitate about spending money on. No one wants to risk their money (especially in today's economy) and waste in on a useless/poorly designed/etc. product. Once consumers try out a new product (for free or at a discount), if they like it, they will continue to use it. As a Buzz Agent, I take it a step further and share how I feel about a product with other people - whether I like it or not, and why. I then provide my feedback, and the feedback of the people I Buzz, to the company, and then they can modify (or not) their product as needed. If I had to choose, evolutionary is certainly the preferred method, but I think creationist WOM done right isn't anything inherently bad. Especially if you have a product that is more likely NOT to build traditional evolutionary buzz.